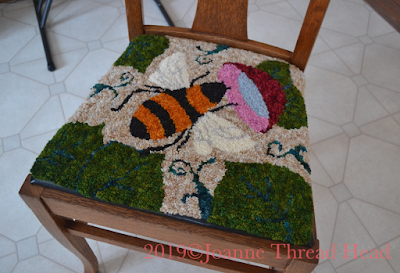 I finished a punch needle, wool, chair pad this week. 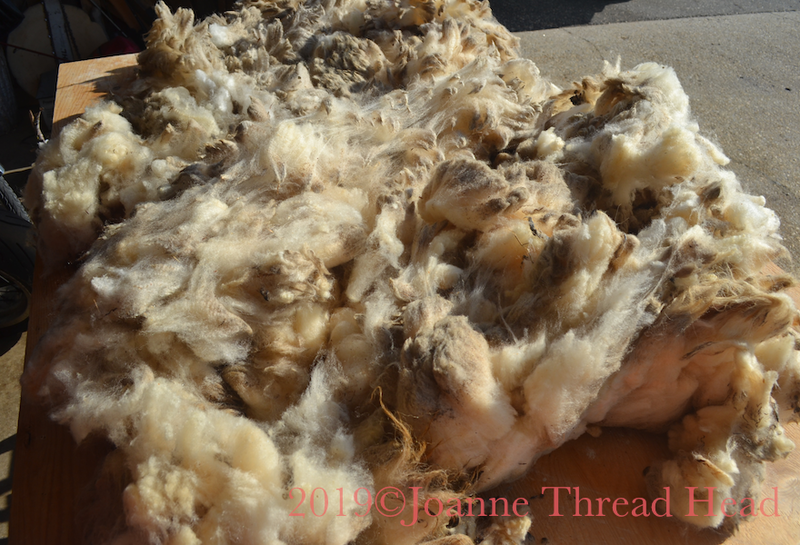 The project started as another raw fleece that I was given. 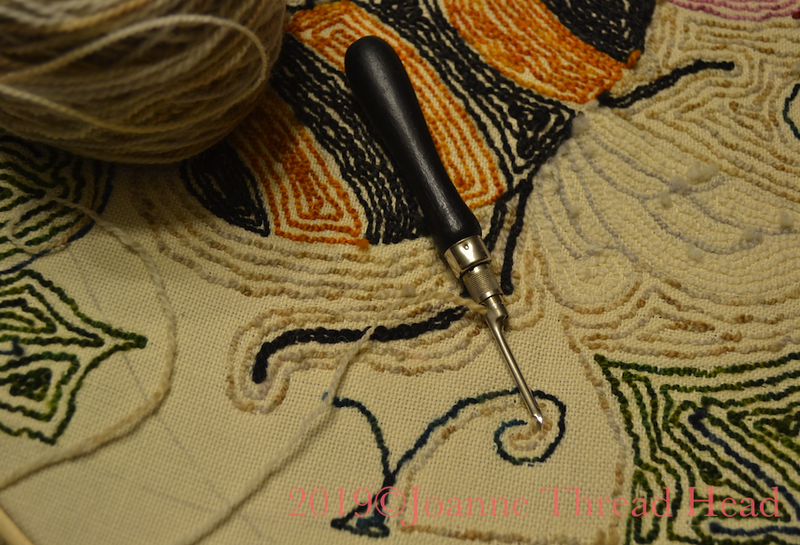 Punch needle is worked from the back with a special tool. 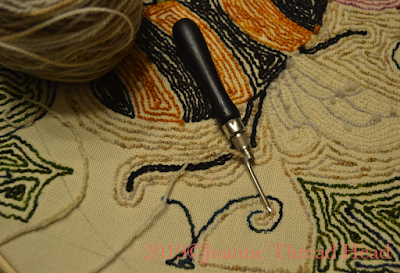 I drew the design on a piece of 22 count Hardanger fabric that I had - it worked well (I think punch needle is generally worked on Monk's Cloth or a linen fabric). 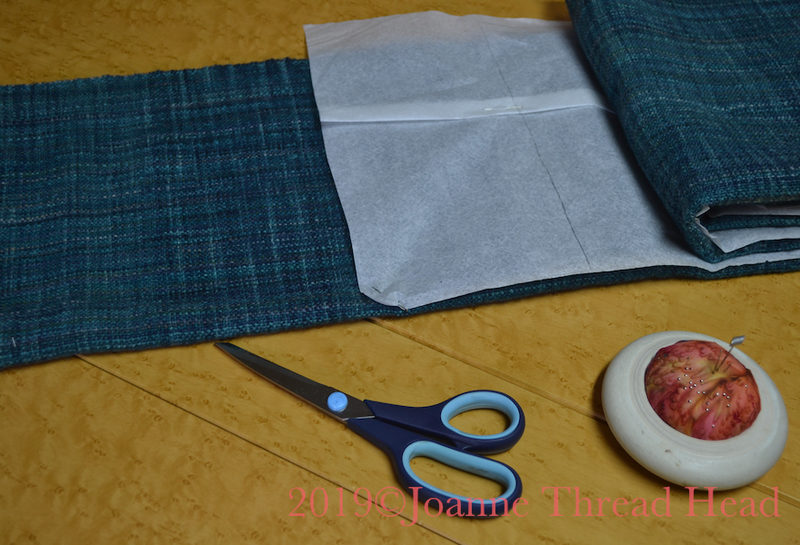 When the work was all done I steamed the piece and pinned it out to block it. To finish the chair pad I used the serger to finish off the edge of the fabric about 1.5inches from the punch needle, pressed the fabric to the wrong side and then whip stitched it in place. 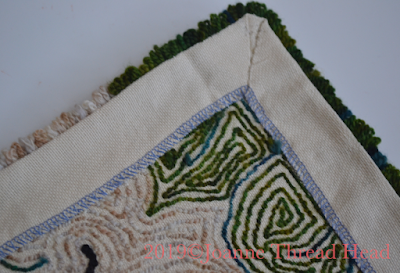 This is the first time that I have done this type of punch needle, it was really enjoyable and worked out well. The wool makes a nice, soft chair pad (I even started another one with the leftover yarn). 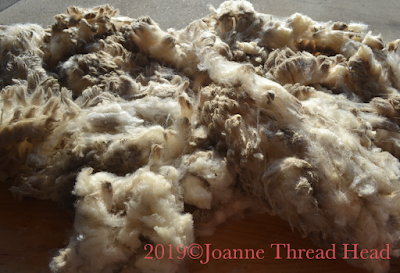 Last week I finished combing another raw fleece, from a local farmer. 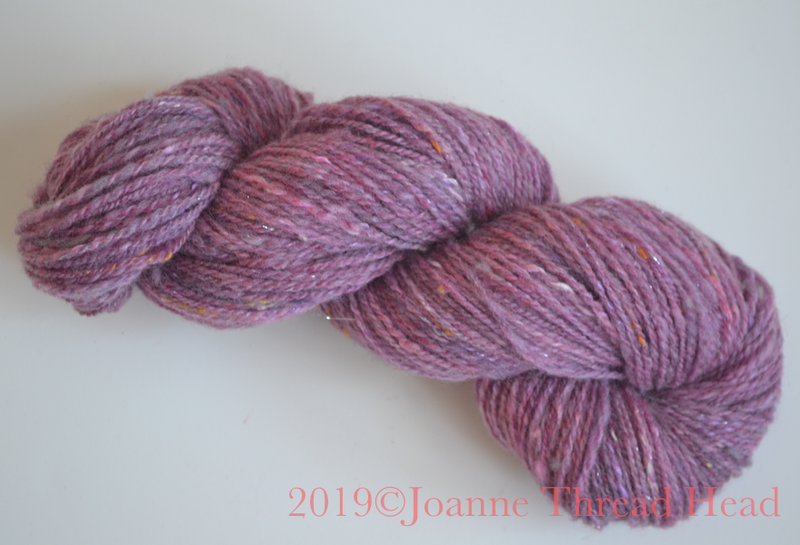 This one was over 700g after washing. The sheep are a cross, but mainly Down breeds (Southdown and Dorset Down) - named for region of England they originate. 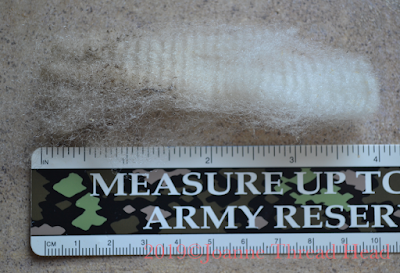 The fleece exhibits the typical characteristics of the breeds - crimpy locks, lofty and resistant to felting. I have been very lucky to have had the chance to work with these fleeces, and this year I want to experiment more with them (usually I just clean, comb and spin the fleece into lovely yarn). 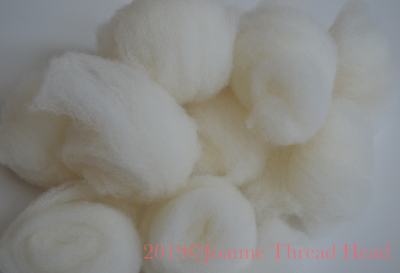 After a bit of reading I discovered that the best way to prepare this type of fleece for spinning is by carding, so this post is about that experience. I did start by combing the cleaned fleece, to remove most of the vegetable matter (carding would just break up the VM, but not remove it). 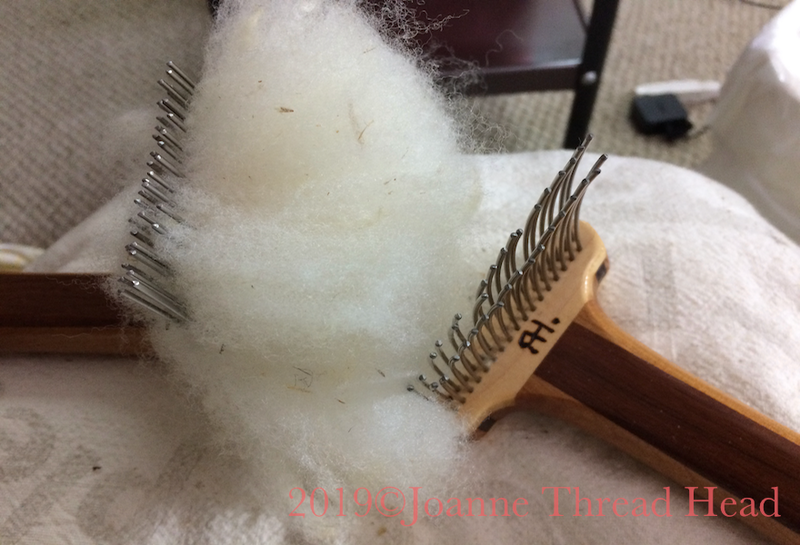 Combing also gets rid of the short cuts and nepps. 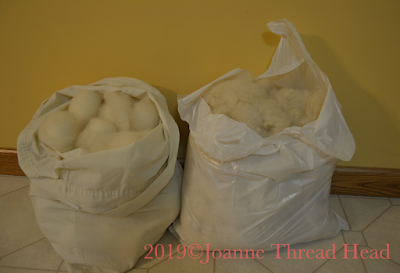 The bag on the left is the prepared wool - 387g. The bag on the right is the 'waste' - almost 50% of the fleece, pretty typical for the breed I have read (it didn't go to waste, this was stuffed into and old pillowcase and used to make a little cat bed). 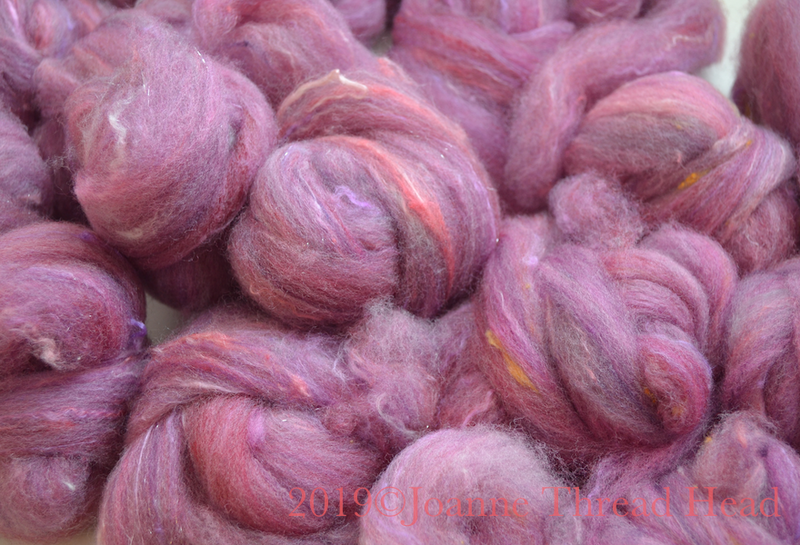 This particular fleece was really fine (compared to others I have spun), so I decided that I would make a sweater with it. 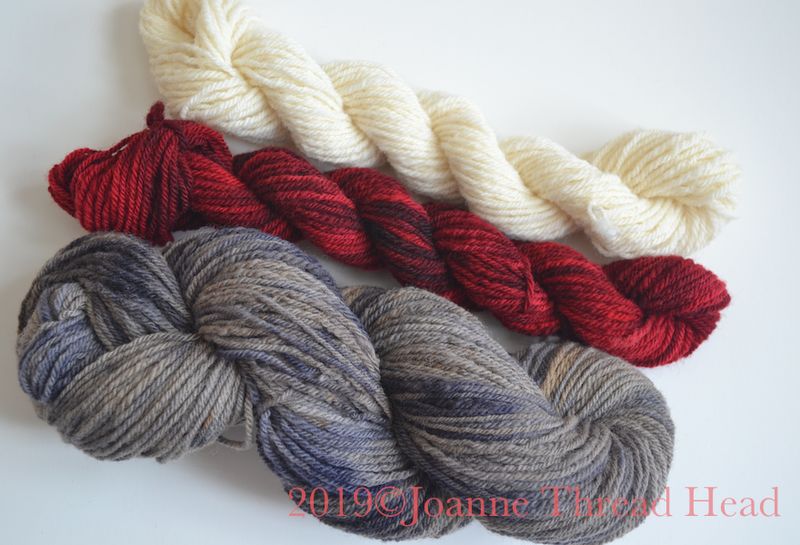 For this yarn I decided to combine the wool with a bit of yak for fuzz, and some silk for shine, for a 83% wool, 11% silk and 6% yak blend. 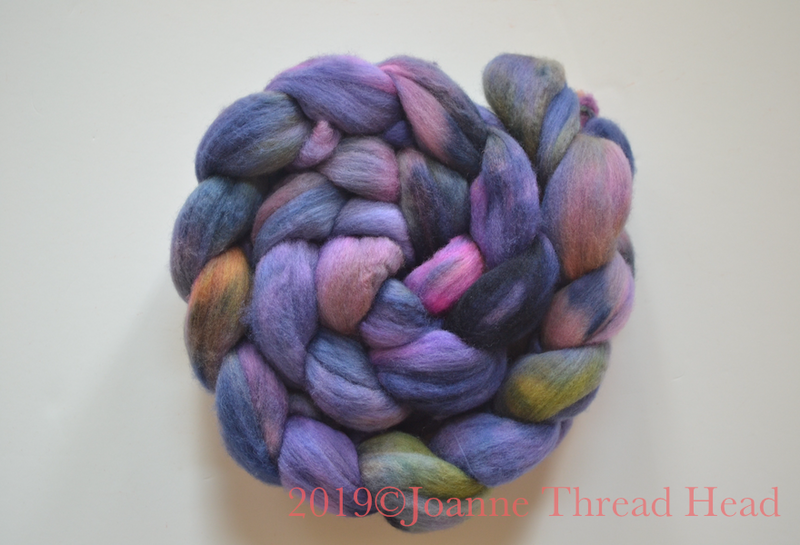 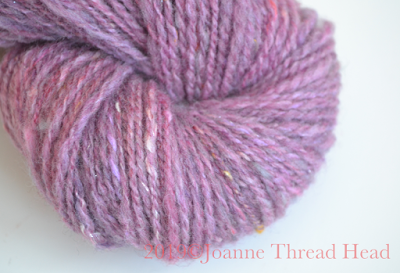 I dyed the fibre before carding (the first time I have dyed this fibre before spinning). 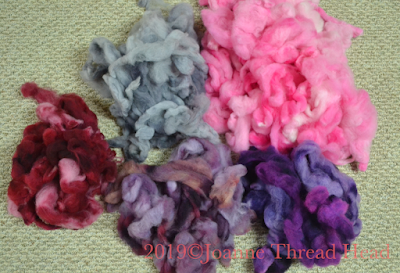 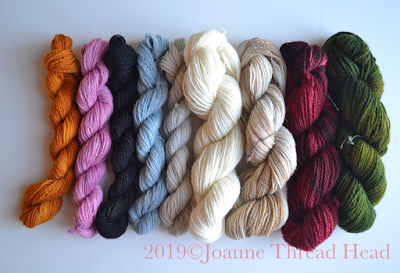 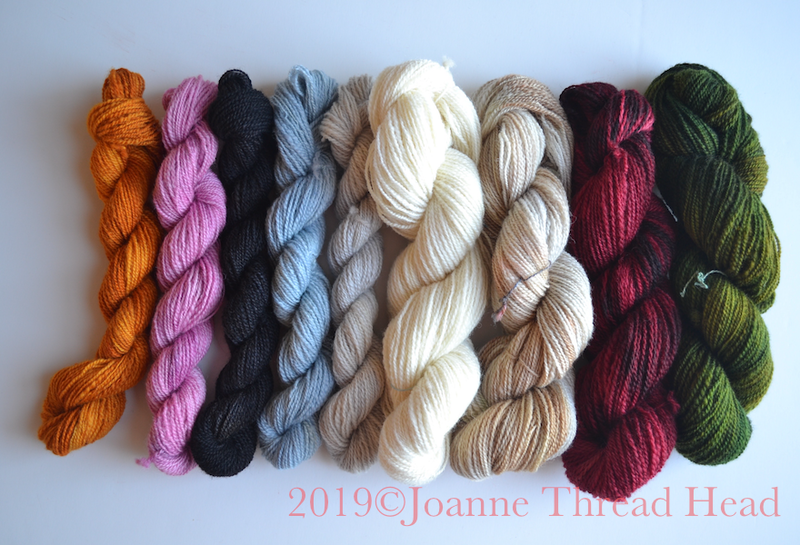 After weighing out each colour I divided the fibre into six piles. 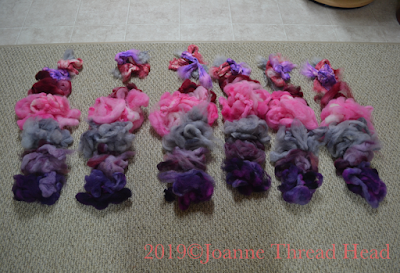 I chose six because my drum carder holds about 100g and I wanted an even number since I am making a two ply yarn and I knew that I would be adding different add ins to each ply. 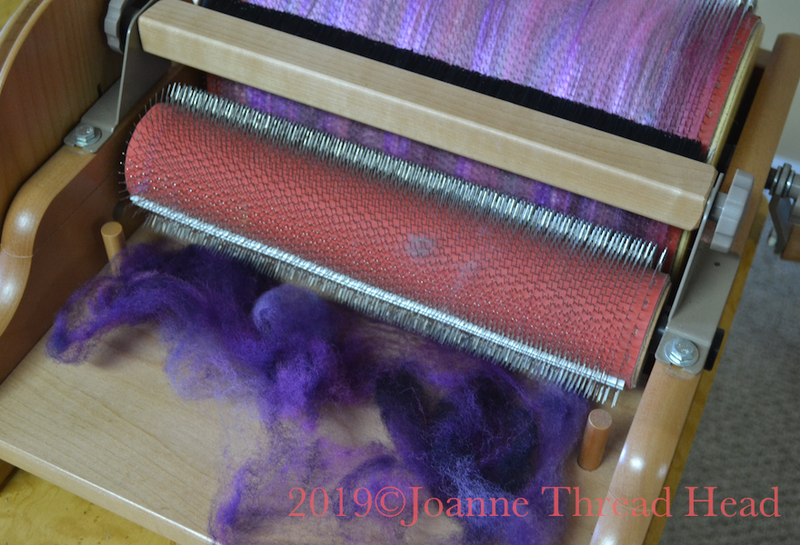 I started by adding the fibre to the drum carder (each batt was about 80g). After the first pass I then passed them through the drum carder (this is an Ashford wide drum carder) two more times. 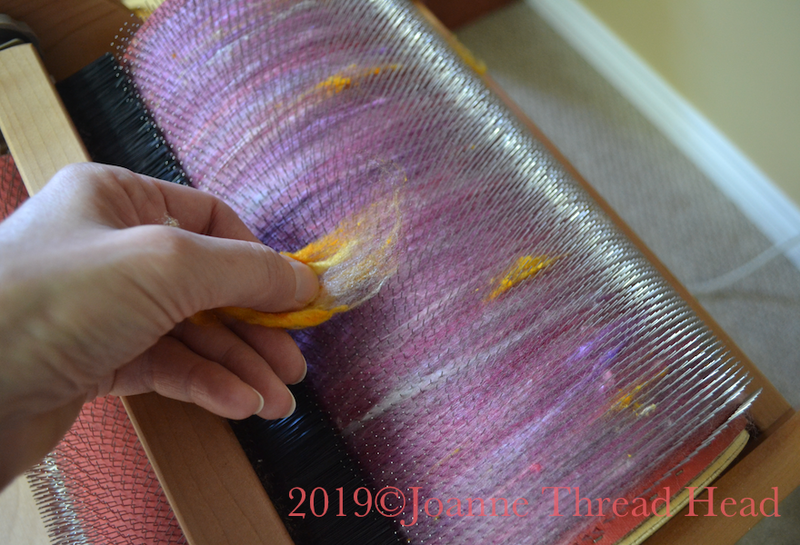 I tore the batt into pieces and spread them out across the layers before putting them back in the drum carder (you can see the shiny silk in the above photo). 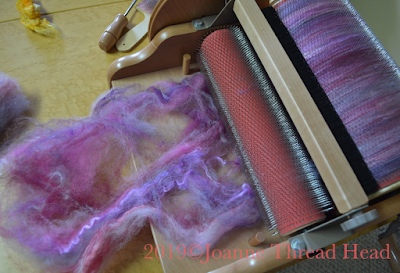 For three of the batts (or one of the plies) I added some dyed raw silk to the large drum during the last pass. The other three batts had a pinch of silver angelina added during the first pass (I couldn't resist a bit of sparkle). 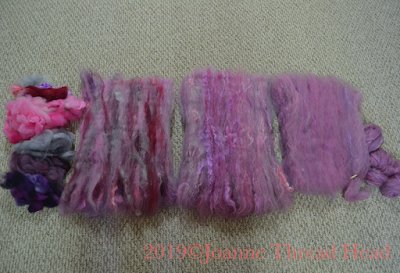 The above photo shows the dyed fibre, the initial pass, the second pass and the final batt. 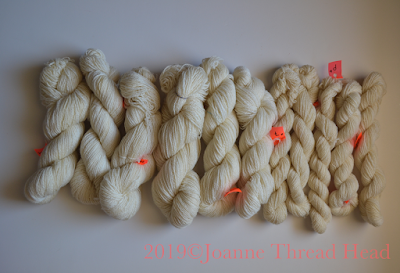 With three passes it was quite well mixed, but you could still see individual colours and fibre types. I dizzed the fibre off the batt ready for spinning (dizzing is just pulling the fibre through a button, essentially pre-drafting). 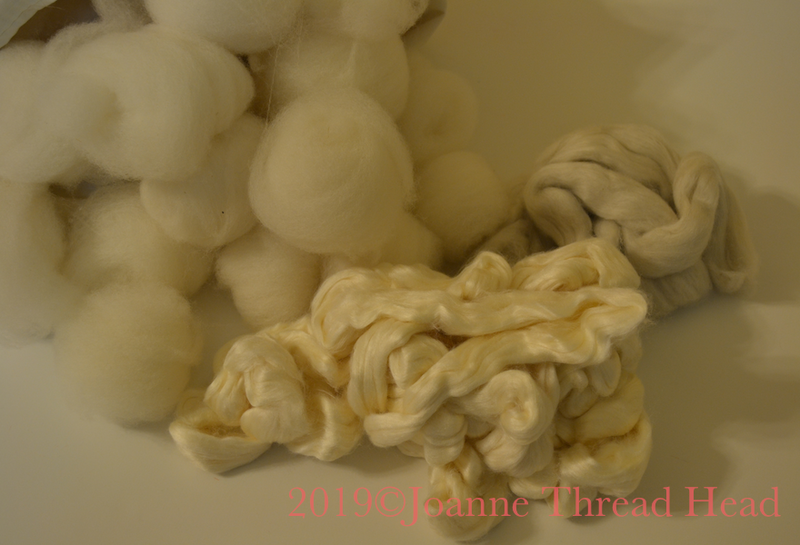 The little bundles ready for spinning - the ones on the left have the sparkle and the ones on the right have the gold coloured raw silk. I made sure to prepare and mix up the bundles for each of the plies before spinning in case there were differences in colour between the batts. 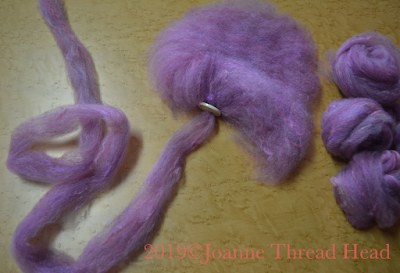 Carding adds lots of air to the fibre and for spinning I made sure to keep as much of the air in as possible by using a short backwards draft and letting the spin enter the fibre bundle. 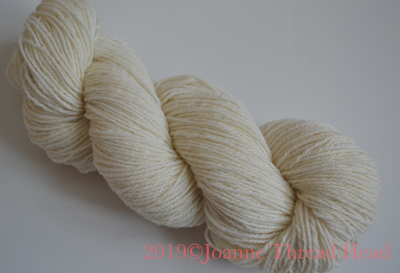 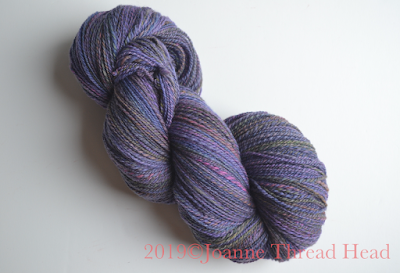 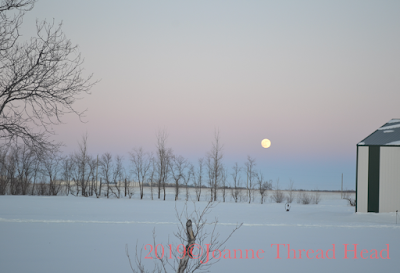 It created a real woolen spun yarn (lofty and light, as opposed to a worsted yarn that has most of the air removed and is denser - the yarn I spun in last weeks post for socks was a worsted yarn). I am really pleased with the colour - it is a nice heathered, tweedy yarn with a hint of sparkle. It puffed out a bit after washing and came out to about a DK weight yarn. 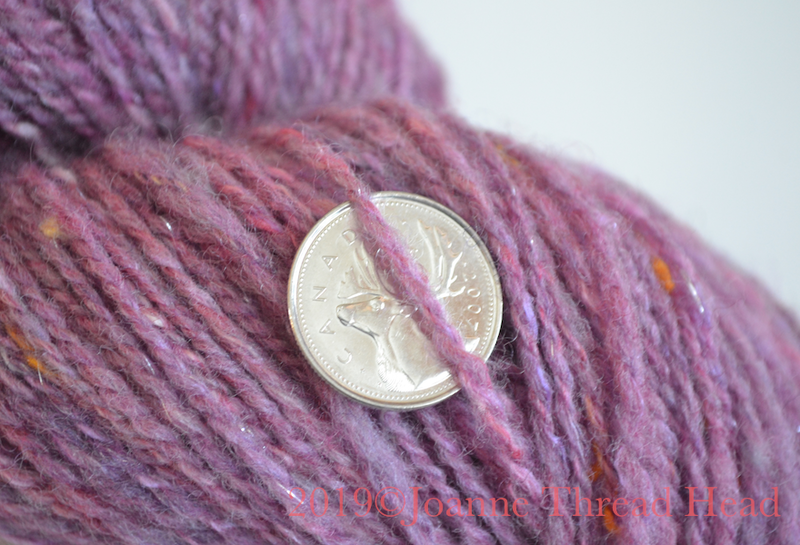 I don't usually sample, but I wanted to make sure that I would be happy with the final product before spinning all the fibre. The knitted sample is really soft (I think I will be able to wear it on my bare skin) and squishy/bouncy, with a nice drape and a little bit of a halo from the yak - I think it is going to make a beautiful sweater. 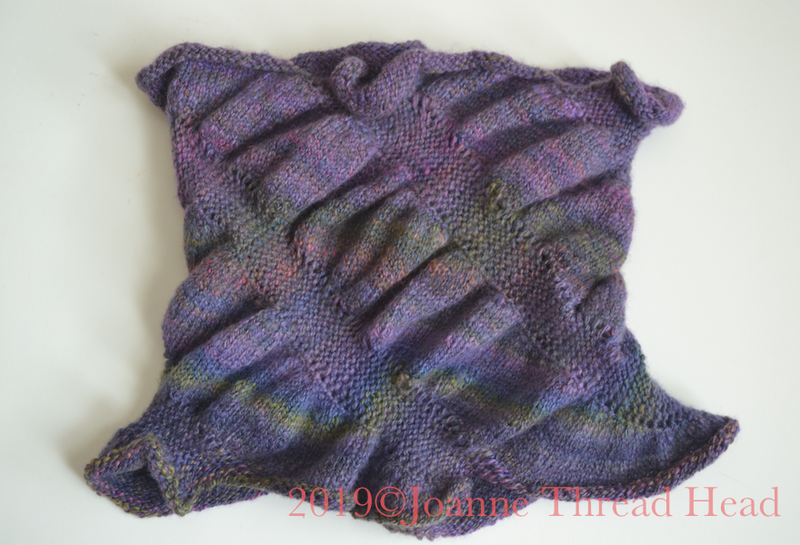 The pattern is Wolkig by Martina Behm - a free pattern on Knitty. This had been my take-along knitting for the past little while. 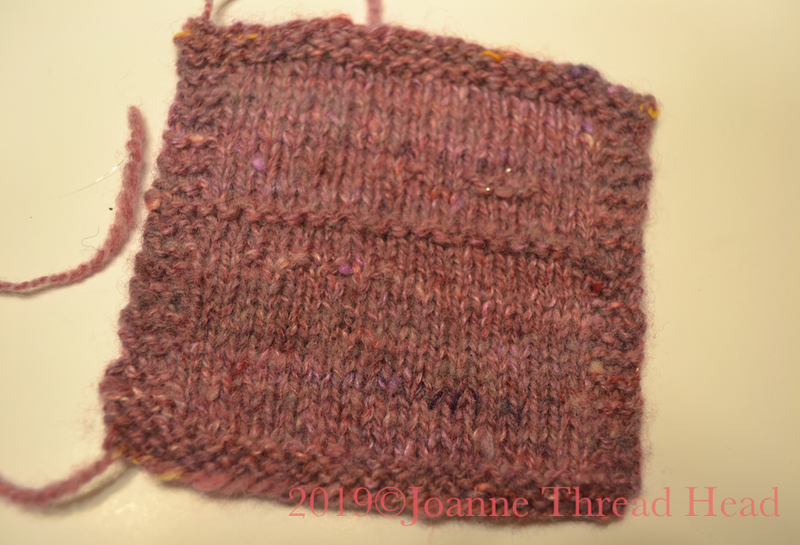 It was really simple to make, but a lot more interesting to knit than just stockinette. which started as this Merino fibre that I dyed. a pair of toe-up socks. 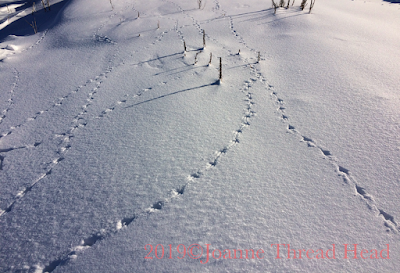 The start of the new year is the right time to look back at the past year and to make plans for the new year. 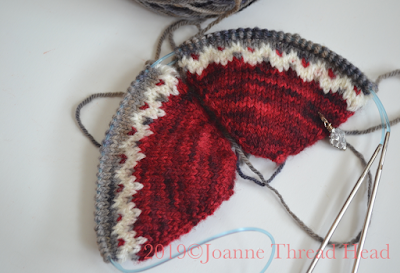 At the beginning of last year I thought I would try to blog once a week since I hadn't been blogging much (I find that it is a good place for me to keep track of things that I make.) I thought that I would last a couple of months, hoped I would last one, and I can't believe that I blogged every week for a whole year! 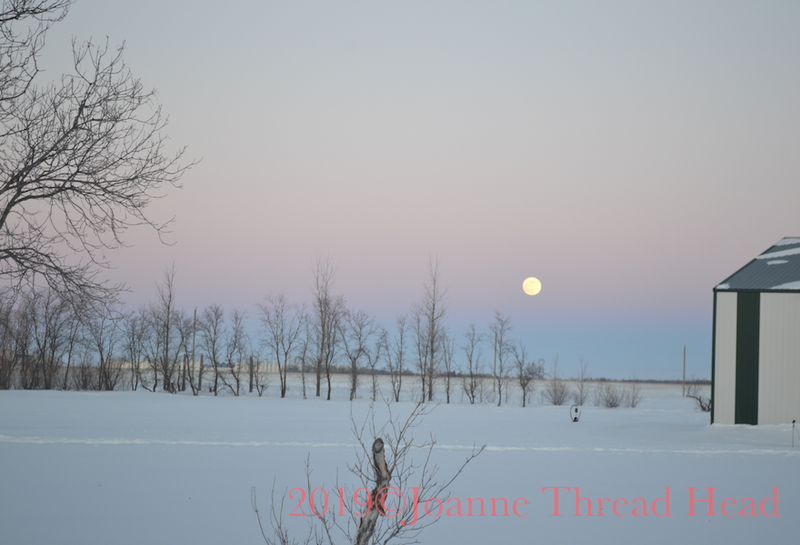 Only one week was a prescheduled post because I was going to be out of town. 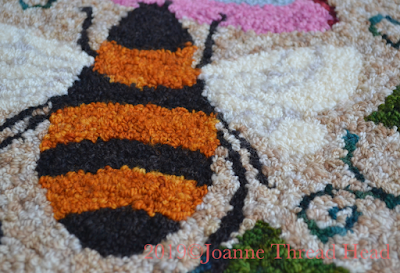 Once again I hope to keep it up this year. 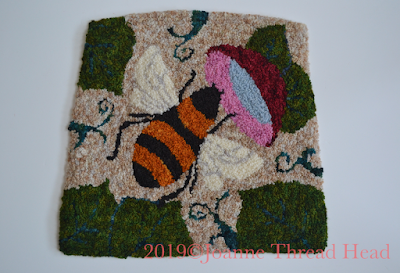 I made a few big projects last year that I am really proud of, two of them involving wool that I was given from a local farmer (they were destined for the composter). I washed, combed, spun and dyed about 5 raw fleeces (some fleeces yielded more than others). 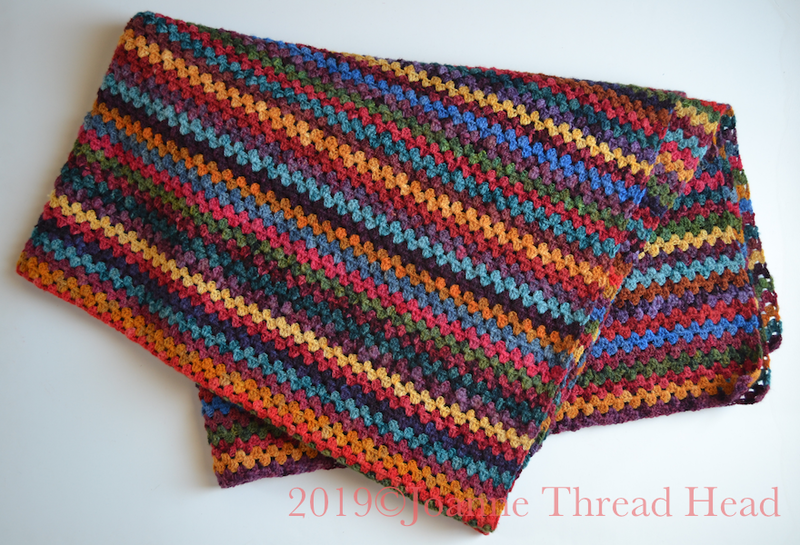 I crocheted a Granny Stripe blanket with two of the fleeces. 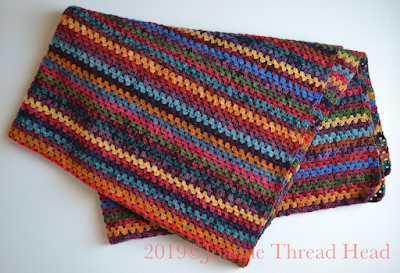 This was my first major crochet project, and the first wool blanket I have made. I wove fabric and made a garment with another raw fleece (handspun tunic). I hope to do it again this year. I also started sewing garments (with commercial fabric) this year which I hope to keep up (I love sewing and don't really need more quilts). 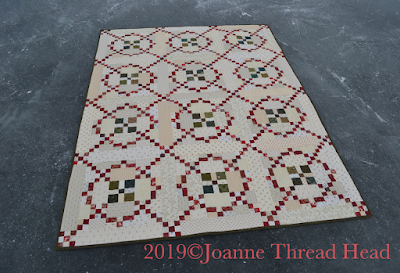 I pieced a couple of quilt tops and lots of quilt blocks, but only finished one quilt this past year. It has to be one of my favourite quilts (the latest one always seems to be). 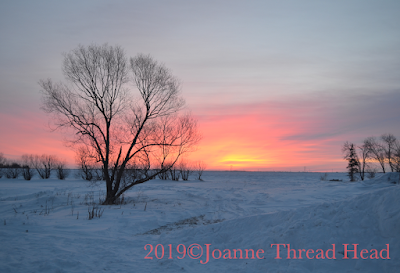 The biggest change that we had this year is that we bought a farm. Living in a rural setting is wonderful! 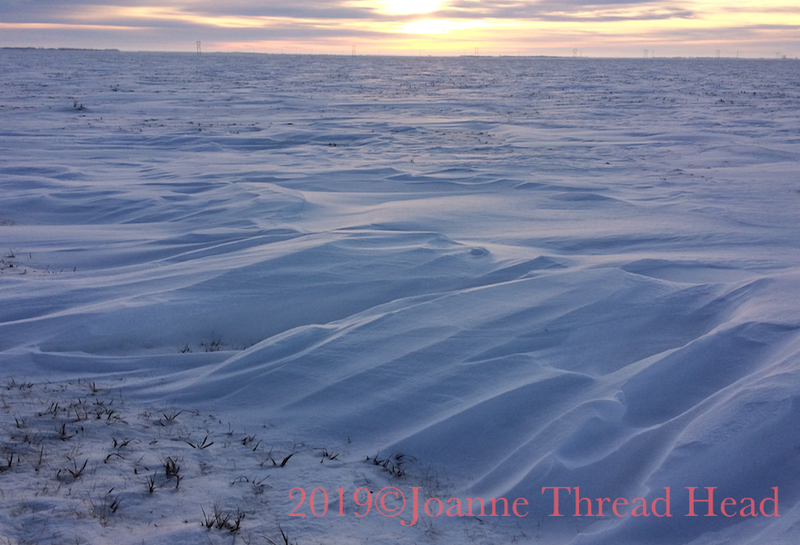 There is about 6 months of snow a year where we live, being out here has made us all really enjoy winter. 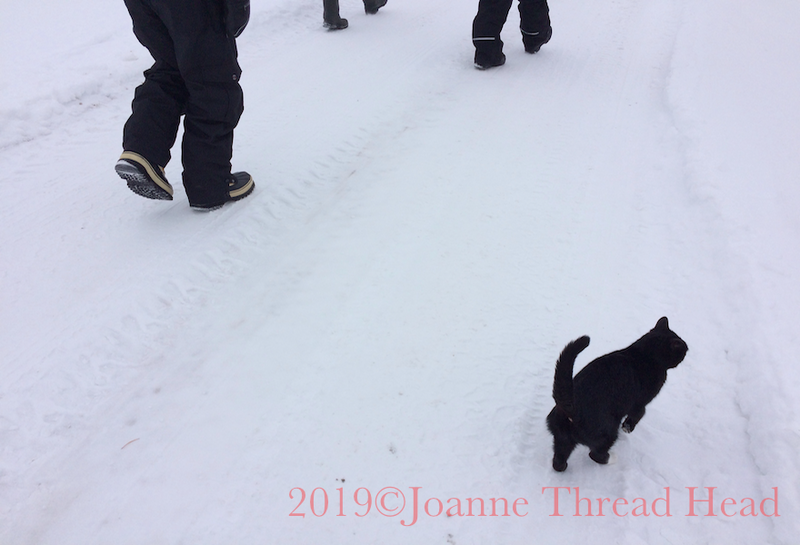 There is so much more for us to do than just going for a walk around the block. 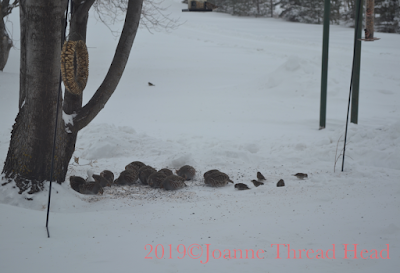 It will be interesting to see what the warm weather brings us too. 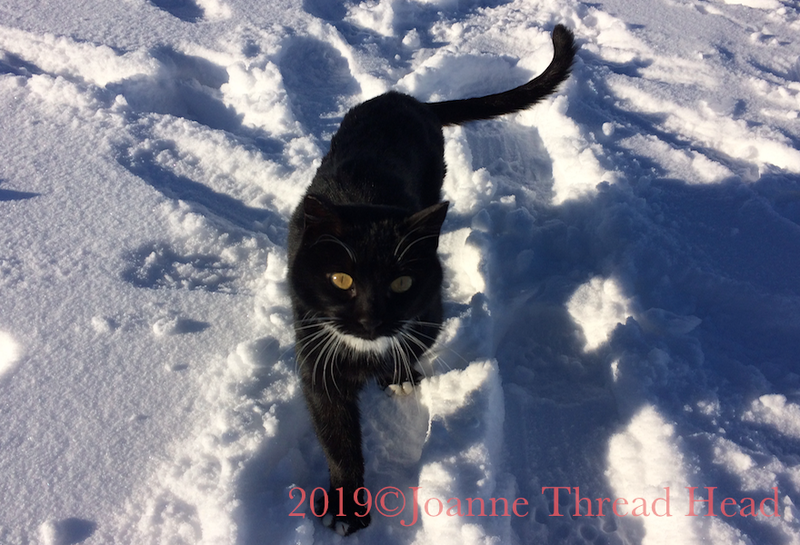 She has always been around since we moved here (shy at first), we just assumed she was one of the neighbours (one 1/2 a mile away and the other about 1 mile away, the previous owners never mentioned a cat). 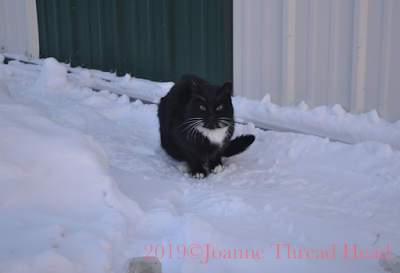 Around Christmas we didn't see her for about a week, she was always very thin but came back even thinner. We watched her stalking birds - unsuccessfully (a black cat isn't very camouflaged when her surroundings are all white), plus it was very cold, so we decided to let her live in the garage (there was a cat/dog flap in the door already, a couple of us are allergic to her otherwise she would probably be in the house). Even before we fed her and gave her a warm bed she would follow us on walks - she seems better than a dog at staying close. She is still very leery of us, but is free to come and go. As for my plans for this year, since we downsized our home it has made me reevaluate what I make, although a life time of being a maker is a hard thing to change. 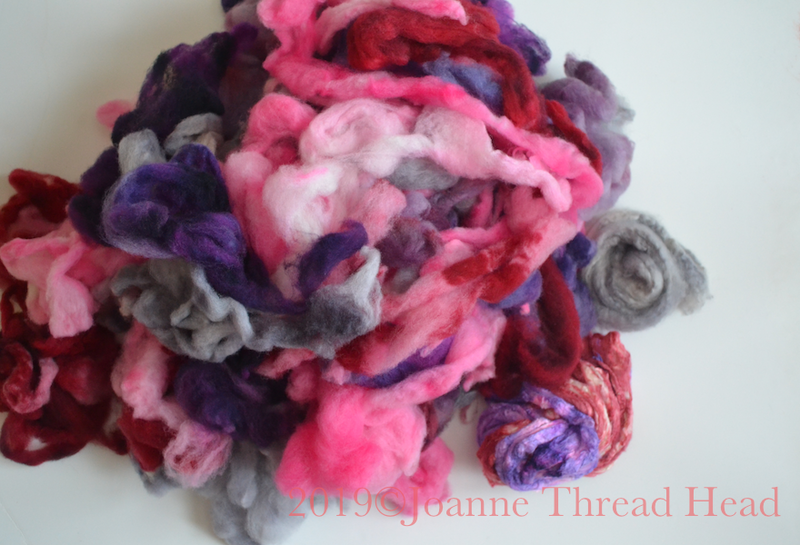 I would like to experiment more with spinning, especially with raw fleece. 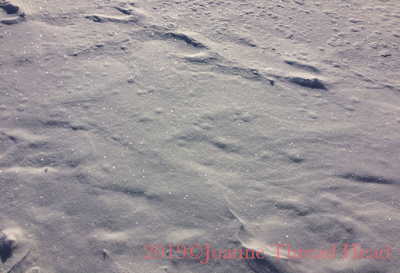 I'll finish with a couple of snow pictures (since it seems to change every day).